The four bay array back up, after installing a new set of baluns and phasing lines. After working through the steps in the last installment, we were eager to try and make a QSO on 2 m EME. We just had to make a quick set of cables to replace the broken horizontal feed line. 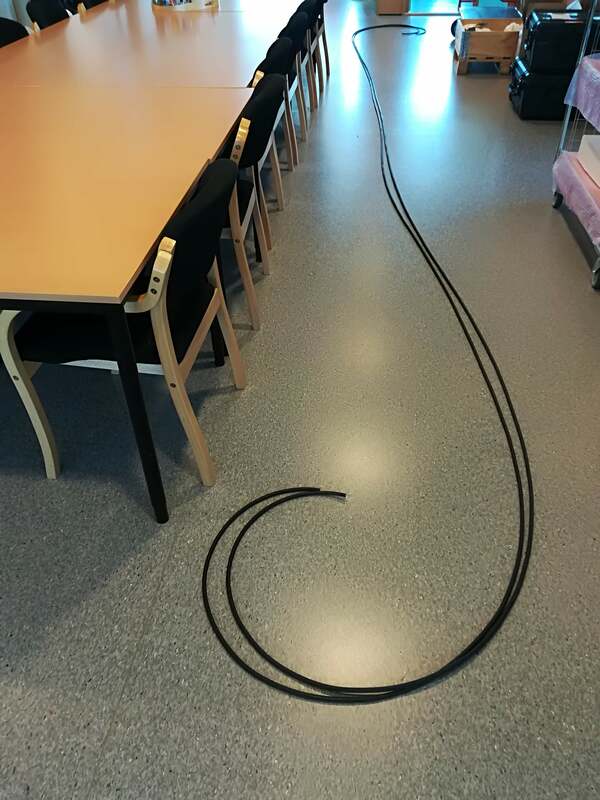 Two equal length cables were prepared, one to replace the broken horizontal one, and one to replace the previous vertical one. The vertical one is also going to be replaced, so that both feed lines are equal length. This way we can more easily do phase combining if we want to use circular polarization in the future. We replaced the horizontal line, and were ready to roll. There was not enough connectors left for two cables, so we only replaced the broken horizontal polarization feed for now. 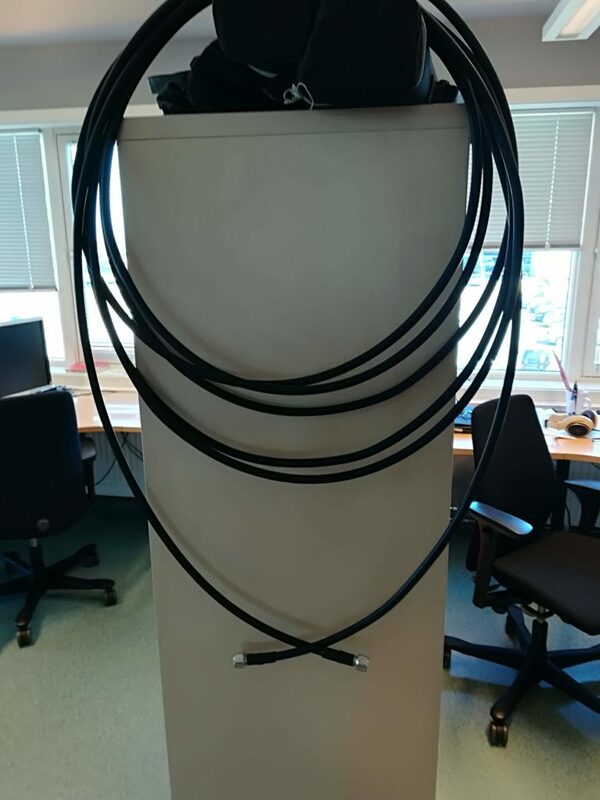 Two equal length cables prepared. OK, good. Everything is in order – time to turn on the radio, and work some contacts off of the moon. 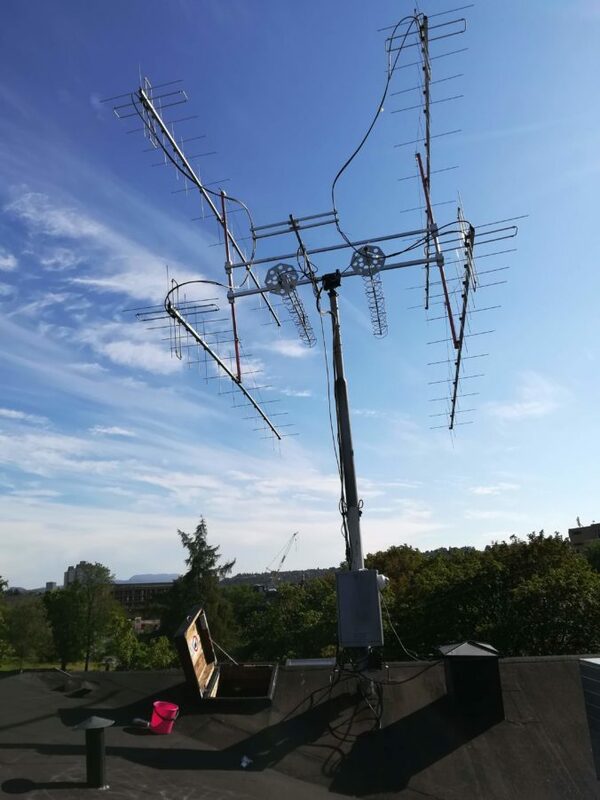 Or so we thought… It turns out that not being QRV on 2 m EME for a long time causes a very large amount of unwanted signals to appear on the band. Our noise floor started off at S9+20 dB, something had to be done. Luckily, we had received a very generous donation from Bjørn at Rohde & Schwarz Norway last year. 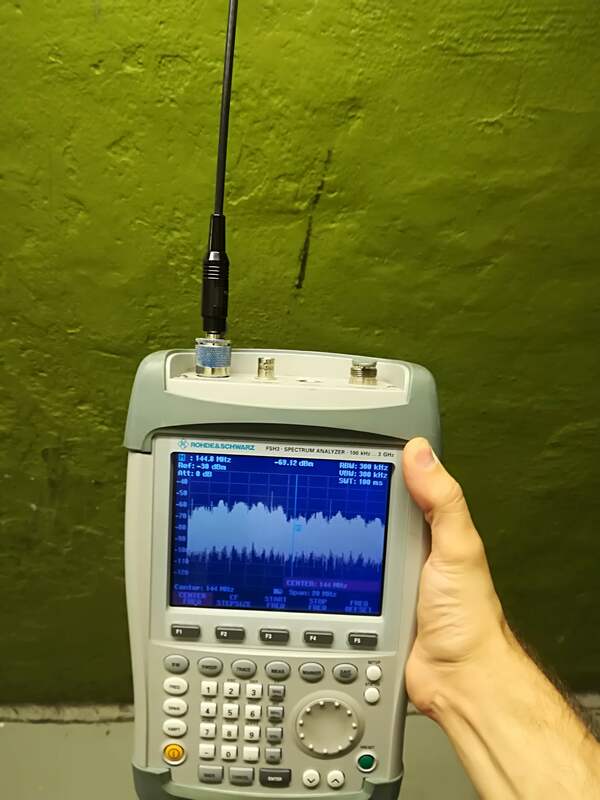 The portable FSH3 spectrum analyzer, which was about to be put to good use! 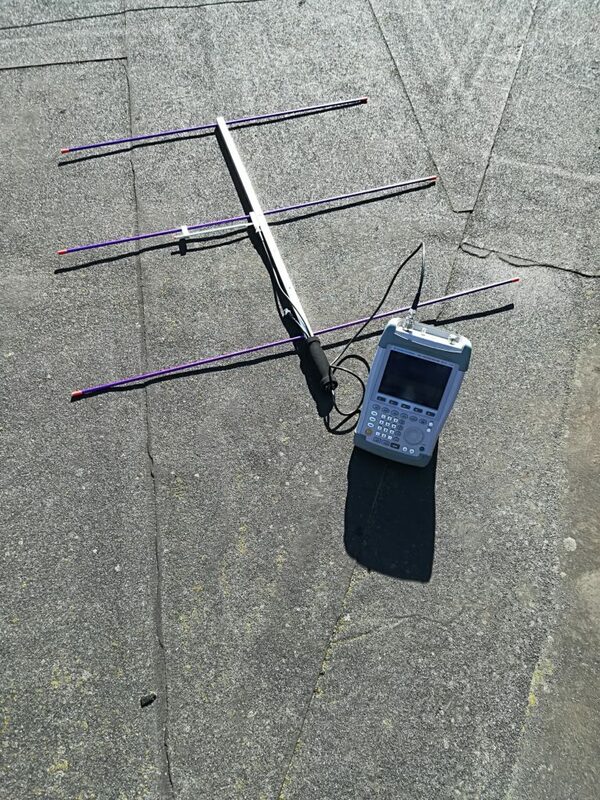 The FSH3 in combination with a Arrow II yagi antenna makes for a good noise hunting setup. 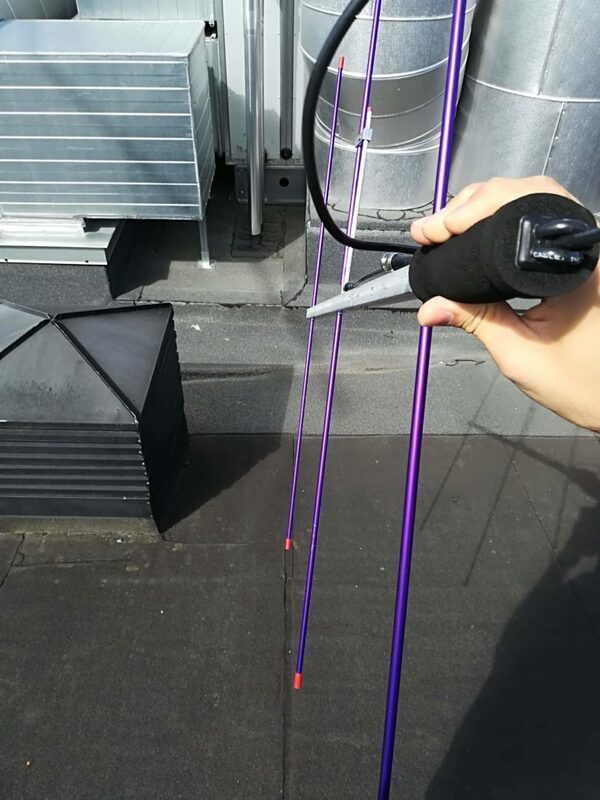 We started on the roof, and tried to locate the noise source(s). 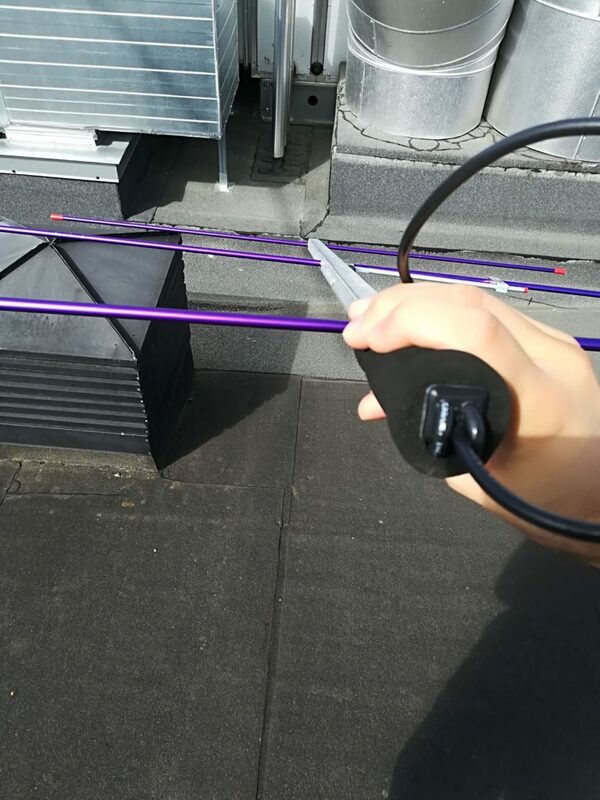 The general procedure is to stand in a spot, and then sweep the measurement antenna, an Arrow II yagi in our case, over the area where the noise might come from. The noise can be any polarization, so the user rotates the measurement antenna in order to find noise sources. 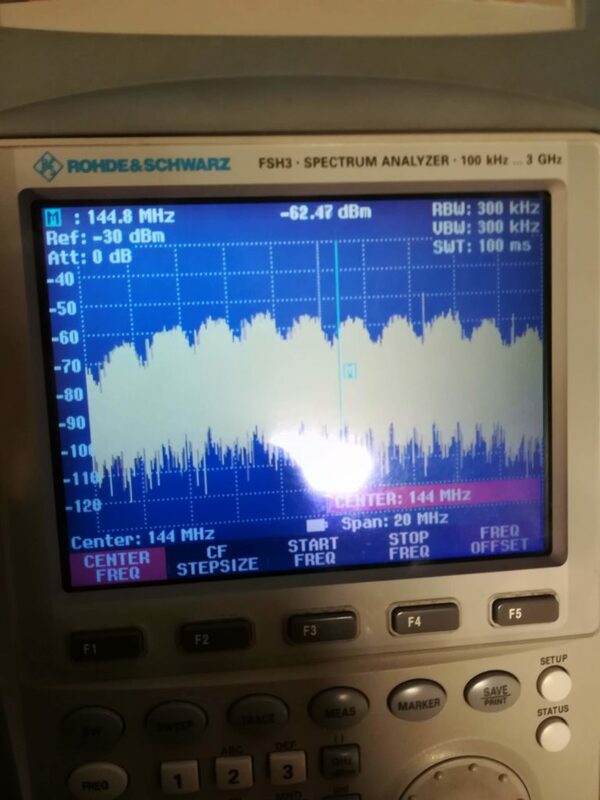 The internal preamplifier in the FSH3 helps a lot with picking up these weak signals, and after a short while we had found our first noise source! The first culprit was a newly installed camera, which we intend to use for monitoring our antennas under use. After removing its power source, we went back to the radio to check our results. Success, the noise floor was down to S9. The likely issue with the camera is that it is powered over PoE (Power over Ethernet), and that it uses an unshielded CAT5 cable for sourcing this from a network switch. In the future, we will add a shielded CAT5 cable to power this device. By using shielded cable we can also add ferrites outside the shield* to prevent any unwanted radiation. *The reason ferrite can not be used on unshielded cable, is that the ferrite will load the RX/TX lines, increasing the inductivity of the signal line to a level where it will no longer be able to “hear” the other end of the cable. S9 is still too high for working EME. Ideally, we would like the noise to be around S0, but S3 or S4 will probably suffice. Having removed the strongest source of interference, we were now able to see some more noisy contributors. This is an example of how bad the noise can get. The next noise source was located inside Samfundet. 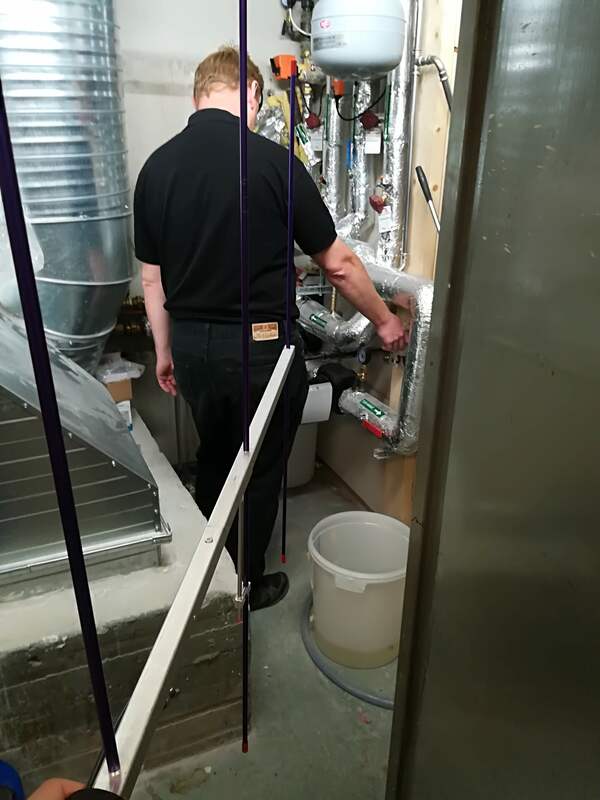 First we thought that it was the newly installed ventilation aggregates that made the noise, but with a little help from Tormod (Samfundet’s “fix-it guy”), we were able to trace the noise down to where it was coming from. This noise turned out to be a bit of a headache to fix, since it comes from a power supply which powers parts of Samfundets door access and fire systems. By turning off the supply for a brief period, we verified that it was indeed causing the trouble. With the supply off, we were reading S6 on the Radio. We attempted to fix this with some ferrite, but we were only able to get it down to S7 using this method. More expansive measures need to be taken to fully arrest the noise. Since this powers such a critical part of the building, and is housed inside a “fuse box” style chassis, we will need to get some help from an electrician to make any alterations. Working our way through the rooms in pursuit of the noise source(s). Once we found the noise we swapped to a more convenient antenna to monitor our remedies. The analyzer shows the same spot as the picture above, but after applying ferrites – seems to have worked atleast a little bit. Obviously there are more noise sources, since the noise floor is still at S6 with the supply turned off. For now it is too tedious to dig them out when the S9 (or S7 after ferrites) source is present. Therefore we are waiting until we have fixed the largest contributor to look for the rest of the noise sources. Meanwhile we decided to try working some EME anyway. The period between 13. and 17. of July, featured the lowest total degradation of 2018 – meaning that the EME conditions were extremely good. 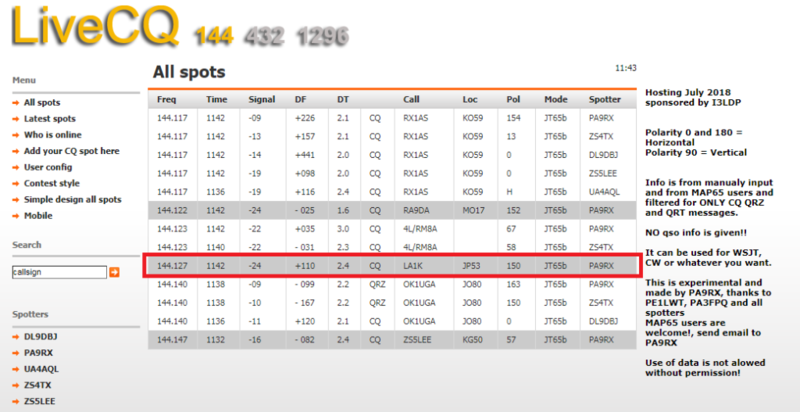 PA9RX receiving a CQ from us on 2 m EME. We were able to confirm reception of transmissions from both our horizontal and vertical set, meaning that our efforts last week were successful. :)Thanks to PA9RX and ZS4TX for your reports!